Looking for something to do this weekend? There are plenty of cool events on in the city over the coming days. We've teamed up with Dublin Gazette to bring you the best of what's on in Dublin. 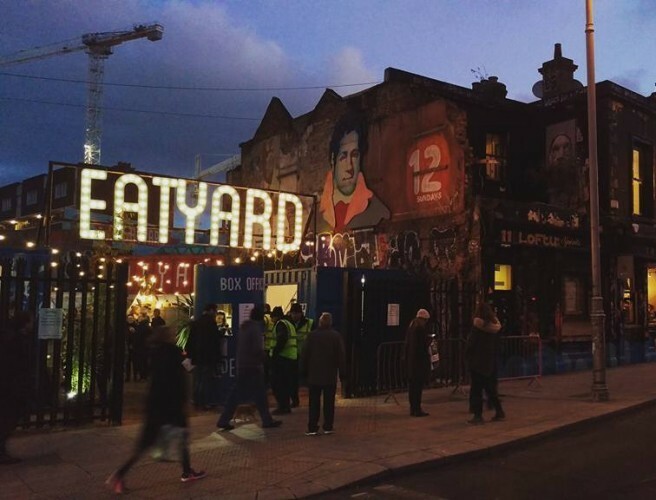 A month-long celebration has launched in Eatyard. The popular street food market, located beside the Bernard Shaw on South Richmond St, will be taken over by Jameson over the next four weeks to mark the release of their Caskmates IPA edition. The new drink combines the smooth taste of Jameson Irish Whiskey with the light hints of hops and the fresh citrus and floral notes of IPA. You can check out more information here. Dublin’s flyest Hip-Hop collective returns to Tengu on Great Strand Street on Friday night. "From Drake to Cardi, J Hus to J Dilla, it’s the only place to find fresh hip-hop, smooth R’n’B and bangin’ trap." Stephen Bishop (St. Bishop), Heather Lawrie (HeatheR), Nassim Missaoui, Hannah McKenna and Nicola McGarr will take to the Sugar Club stage to recreate the classic sound of the record label that defined the sound of the sixties and went on to influence generations to come. Ahead of an appearance at the Galway Theatre Festival, Writer/Actor/Director Ronan Dempsey brings The Words Are There to the Mill Theatre in Dundrum. The Words Are There is a compelling and timely new piece of innovative physical theatre that delves into a lesser learned side of domestic abuse. The three day festival is considered as the 'Fringe' of Irish new music festivals. Now in its third year, the festival is a platform for the newest contemporary electronic music, hosting four concerts over three days. The festival ends on Saturday, April 14th. A gaming conference will take place at Griffith College this weekend, aiming to raise vital funds to help combat homelessness. 8-Bit gaming will host a six-hour event including retro gaming consoles, YouTube/Podcast workshops, exhibitions and tournaments with profits going to both Simon Community and Inner City Helping Homeless (ICHH). Attendees are asked to donate what they can, even by bringing blankets or clothes to the event. The event is takes place on Saturday from 10am to 1pm and is free, but tickets must be pre-booked through Eventbrite.ie. The two day festival that celebrates the video game features meet at greets, tournaments, Q&A panels, build battles and more. Check out more information here. Yamamori on Great Strand Street will play host to a brand new show dedicated to exploring samples of the tracks of some of the world’s most famous rappers this Saturday. ‘Scratching the Surface’ is set to dive into the past and present of Kanye West’s career as a rapper and producer, with an interactive presentation on the his career. Host of the night, Mr Myth, will bring the audience on a journey through West’s work, and recreate his tracks in front of an audience using the same records sampled by the Chicago rapper on his own songs. There will also be a ‘Kanye inspired’ DJ set and an auction for a one-off Kanye print. On the night, 10% of ticket profits will go to Pieta House. Tickets are available now on Eventbrite.ie. St Vincent’s might have taken home four of the last five Dublin Senior Football Championships, but as the new group format gets underway this weekend, the 2018 rendition looks set to be one of the closest yet. By reducing the number of sides competing for outright county glory to 16, from the traditional 32, the competition promises to be more competitive than ever from the off. Two intriguing double-headers take place on Saturday. In Parnell Park, Ballymun Kickhams take on St Brigid’s at 4pm, followed by Kilmacud Crokes against Ballyboden St Enda’s at 5.45. While over in O’Toole Park, St Jude’s take on Ballinteer St John’s and Castleknock take on Clontarf. Dublin's midnight movie club will be screening 'Cat People' (1942) and 'Kiss Me Deadly' (1955) on Saturday night. Looking to bag a bargain? The Grand Social hosts a weekly indoor flea market from 12pm-6pm. The line-up features "four of the funniest and most sought after talent on the circuit"! One American, One British, One Northern Irish and One Irish for a hilarious show. Bingo with Shirley Temple Bar has been running every Sunday night in The George since 1997. The show kicks off at 9:30pm followed by DJ Karen on the decks. Making the Grade, Rampage and Truth or Date hit cinemas this weekend. An observational documentary which shows the relationship between Irish piano students and their teachers. The action adventure stars Dwane Johnson as primatologist Davis Okoye, a man who shares a special bond with George, a rare albino silverback gorilla. But when a rogue genetic experiment gone awry mutates this gentle ape into a raging creature of enormous size, Okoye must try to stop a global catastrophe and save the creature that was once his friend. A harmless game of Truth or Dare among a group of friends awakens an evil spirit.